South American Fox skull. Pseudalopex griseus. 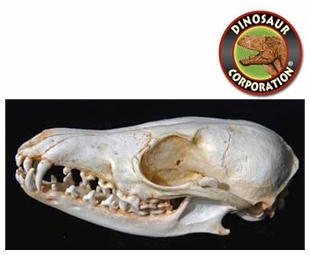 S. American Fox skull replica is cast from original specimen. From Patagonia Argentina and Chile and the Pacific coast to Ecuador. The South American foxes (Lycalopex), commonly called "zorros", in Spanish, or "raposas", in Portuguese, are a genus of the dog family from South America. Despite their name, they are not true foxes but are a unique canid genus more closely related to the wolves, dogs, jackals and coyotes than they are to foxes, which they somewhat resemble and after which they are named. The South American gray fox Lycalopex griseus, is the most common species, and is known for its large ears and a highly marketable, russet-fringed pelt.